BANGUED, Abra – The government, through the Office of the Presidential Adviser on the Peace Process (OPAPP), and the unified command of the Cordillera Bodong Administration – Cordillera Peoples Liberation Army (CBA-CPLA) recently renewed the historic Mount Data ‘sipat’ or the gesture to end armed hostilities to strengthen their relationship toward the realization of lasting peace in the countryside. 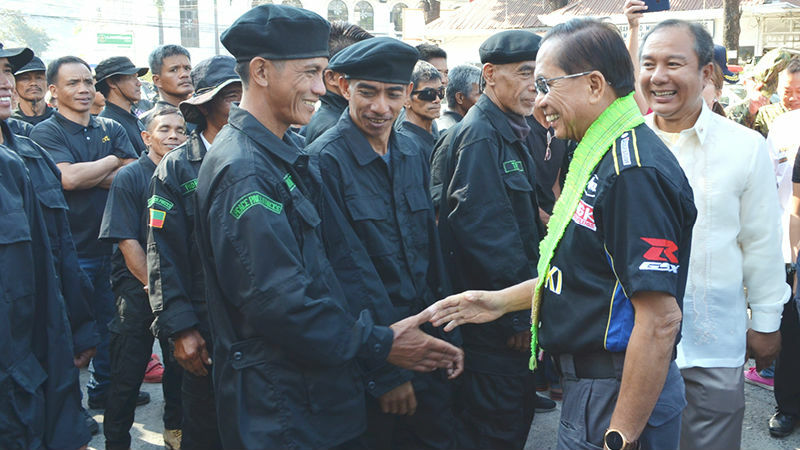 The renewal of the historic agreement that was entered into by former President Corazon C. Aquino and former rebel priest was done by Presidential Adviser on the Peace process Jesus Dureza representing the government and unified CPLA chairman and Vice Governor Ronald Balao-as during simple rites held at the Provincial Capitol Social Hall Wednesday. Vice Governor Balao-as pointed out the renewal of the historic ‘spat’ will serve as a warm up to the peace agreement so that the parties will remain committed in fulfilling their commitments for the realization of lasting peace in the countryside. “We remained committed to the Mount Data ‘sipat’ and the Manabu ‘pagta’ and we never violated their provisions for the sake of lasting peace in the Cordillera. We want sustainable peace so that we will be able to uplift the living condition of our people who simply want to live in a peaceful environment with stable sources of income for their families,” Balao-as stressed. For his part, Secretary Dureza agreed to pursue the warming up of the peace agreement to keep the desire of the people for peace burning which is in consonance with the efforts of the present administration to engage everyone to work for peace. “Peace is a work of a lifetime that is why we continue to look into ways and means to engage everyone pursuant to the marching orders of President Rodrigo Duterte to be inclusive in our peace efforts,” Dureza stressed. He assured that the OPAPP is working on a program for the establishment of peace and development forces wherein the CPLA members could be part of the initiative considering the need for them to be trained and will be provided with sources of livelihood projects. According to him, the Cordillera has more than enough barren areas that could be planted with coffee wherein every CPLA member will be assigned an area to plant, nurture and make sure that the planted coffee will bear fruits the desired beans which will be sold to ready buyers at the prevailing market price. Aside from being paid their salaries for the production of the coffee beans, the Palace official claimed that the growers will also be receiving a share from the sale of their produce to help augment their wages. On the other hand, for those who really want to handle arms, the peace adviser claimed that there will be an inventory of their firearms while the said combatants will be trained so that they can be assigned as security guards in various areas in their places which will serve as their permanent source of income to help uplift the living condition of their families. He added that the establishment of the peace and development forces will be cascaded to the grassroots level, especially in the Cordillera, as soon as the details shall have been ironed out by the OPAPP which will serve as a pilot test for the project.